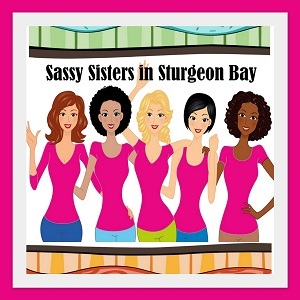 Grab your gal pals and get away to Door County this weekend for the annual “Sassy Sisters Weekend” in Sturgeon Bay, April 20-22, 2018. Bridgeport Waterfront Resort and Stone Harbor Resort have a great time planned for you with a 2 night lodging package. At Bridgeport Resort start the weekend right at the Friday Night Welcome Reception with cheese fondue & dippers and shop a variety of women’s specialty vendors! On Saturday & Sunday enjoy complimentary continental breakfast and a variety of relaxing “activities” from chair massages to group workouts, and a Saturday Evening Sip N Sign event! At Stone Harbor you can participate in the Murder Mystery Dinner by Rogue Theater ($35/each) and catch live music by Sideshow on Friday; and Paint & Sip Door County on Saturday ($35/each) with live music by Panic Station on Saturday night. Activity Sign Up will be available at check in for each resort. 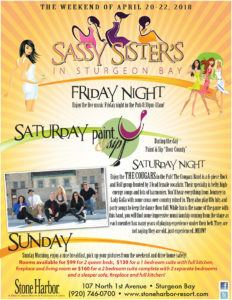 Throughout the weekend explore Door County’s shopping and dining scene with your best girls! Reservations: Bridgeport Resort (800) 671-9190; Stone Harbor Resort (920) 746-0700. 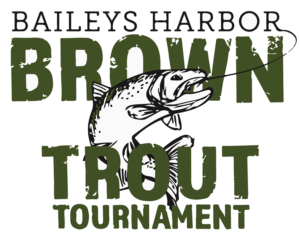 This year is the 30th Annual Brown Trout Tournament, April 19-22, 2018. The top 40 fish caught in Door or Kewaunee waters receive cash prizes including 1st Place: a $1,500 Value Prize Package including $800 in cash and a Door County Vacation Package! Organized by the Baileys Harbor Community Association there are over $7,000 in prizes to be won and tickets are only $25. Participants can fish in both Door & Kewaunee county waters on the bay and lake side. Fish can be caught from a boat or from the shore. There are weigh in stations at Baileys 57 Gas Station, Howie’s Tackle in Sturgeon Bay, and Kaps Marina on Washington Island. Tickets will be for sale until close of business Friday April 20 and can be purchased ahead of time using a credit card. TICKETS MUST BE IN HAND BEFORE FISHING AND WEIGHING IN. Join other anglers and spectators between 9am and Noon on Sunday for the Final Weigh In & Awards Ceremony at the Baileys Harbor Fire Station. Enjoy food and drinks and check out the top 5 fish on display. Live music from 11am-2pm with Frank Maloney & his Big Country Unit. 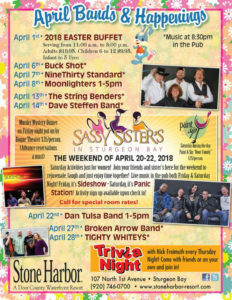 For all ticket outlets, weigh in times and locations, and more information or to purchase tickets, please visit BaileysHarbor.com, email us at info@baileysharbor.com or call 920.839.2366. 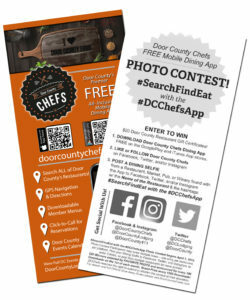 Find great dining options on the Door Peninsula with click-to-call phone number and GPS directions, and check out upcoming events throughout Door County with the FREE Door County Chefs Mobile Dining App! 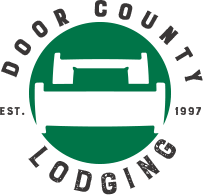 For more information about festivals, live music, theatre and more on the Peninsula, visit our Door County Events Calendar (upcoming events are also accessible from the Door County Chefs Mobile Dining App).